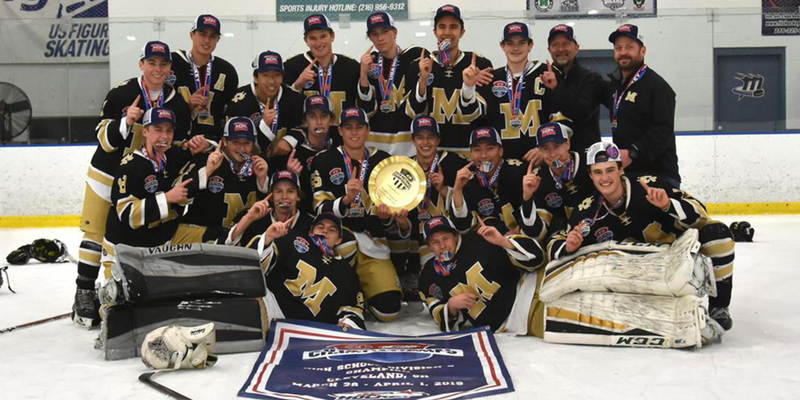 STRONGSVILLE, Ohio – Boulder/Monarch won its first title at the Chipotle-USA Hockey High School Div. 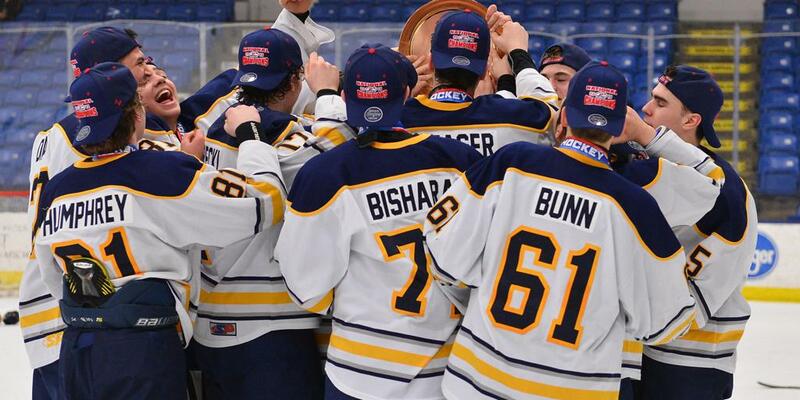 II National Championship after a convincing 7-1 victory over the Burrell High School Bucs on Monday in Cleveland. After losing its opening game of the tournament, Boulder/Monarch rebounded with five consecutive victories, outscoring their opponents 23-7 in that span. Boulder/Monarch’s single loss in the tournament came at the hands of the Bucs in pool play. “We lost to these guys 6-4 and knew they had some really skilled players,” Boulder/Monarch coach Jimmy Dexter said. “We tried to concentrate on a couple of them,” offered Dexter. Boulder/Monarch’s penalty kill was a key factor in Monday’s win. The team scored a pair of short-handed goals scored during a single penalty kill, both coming from Zach Given. Losing their first game certainly provided additional pressure for Boulder/Monarch and Dexter addressed that. Dexter coached his team the rest of the way under the belief each game going forward was a must-win. The group of players who helped lead the charge included Given and his brother Jake. The brothers, who are set to play baseball at the University of Massachusetts next year, missed the first two games of the tournament because of baseball. They returned for the third game of the tournament and Jake earned a hat trick. Dexter went on to say that other players such as Alex Scatena and Fuller Loose also helped lead the charge. Dylan Sheets was also key for Boulder/Monarch in net. Shin Stienbarth added a pair of goals in the championship game while Jordan Finney, Loose and Scatena each contributed goals. Jake Given earned three assists and Scatena a pair of helpers. The Givens brothers and Scatena tallied 3 total points in the game. “These guys (Dexter’s team) are unbelievable,” Dexter said. “It is one of the best teams I have ever had. These guys have such a chemistry, get along and it has been so much fun this season. The win for Boulder/Monarch comes after the program lost in the championship game a season ago. This was the program’s third title game ever, but the first time the team came home a champion.